Today is 4.26, also known as “Alien Day”, and named after the planet in James Cameron’s Aliens (LV-426 / Acheron). It’s a celebration of the entire Alien Franchise, but I’m only focused on the first film as I finally saw it in the theatre in 2017. This isn’t so much a review as it’s just my history with Ridley Scott’s Alien. You can find actual reviews all over the internet, and I know very few people who didn’t enjoy the movie. This piece assumes you’ve seen the film and are familiar with it. There are also spoilers within, though with a nearly 40 year old film, I’m not sure if it can be classified as such. When I was little, my older brother and I shared a room in my grandmother’s house. Below our bunk beds was a open space that contained a set of boxes and each box contained a collection of our toys – board games, knick knacks, things like that. If you needed something, you went under the bed to fetch it. Only thing is, I always reached into those boxes with my eyes closed. I have a vague memory of when my older brother received 3 toys that affected the way I looked at things. The first was a board game for the movie Alien. On it, you had a map of the Nostromo, about 3 Astronaut pieces and one for the Alien. I can’t recall the exact nature of how it was played, but I do remember it having to do with finding a way to reach the Narcissus – the escape ship – before the Alien reached your character. Each player also had their own Alien they could use to hunt the other characters before they could escape. 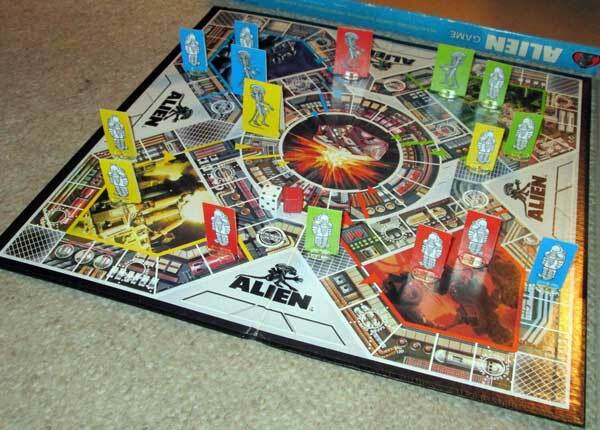 The Alien Board Game. Fox marketed toys for Alien (an R rated film), possibly fearing the mistake they made with Star Wars. The second was a movie viewer. I had to do some hunting around the net to find it, and thanks to The Toy Box, I was able to locate one. These viewers (made by Fisher Price and by Kenner) were really popular, especially after the Star Wars boom. You loaded it with a tape and it would play out a scene. For the Alien tape my brother had, it would play out the egg opening face hugger jump sequence. I rewound that too many times, and perhaps it’s the reason I’m afraid of spiders. I don’t really know for sure. The tape used below goes through most of the film’s plot, so if you haven’t watched the film by now, consider yourself spoiled. The last toy was the reason I never went into the toy boxes. My brother owned an 18 Inch tall Alien figure, complete with a glow in the dark headpiece and a functional second set of teeth. It was one of the scariest things I’d seen as a kid. All of this was thanks in part to Star Wars. With the mistake Fox made in giving the merchandising rights for Star Wars to Lucas and Lucasfilm, Ltd., they missed out a major chunk of revenue. So when Alien was set to launch 2 years later, they greenlit an entire toy line for the film, even though the movie was rated “R” and the toys demographic couldn’t really see the movie without parental supervision. For the time, that was a pretty amazing thing. Back in the early 1980s, my father invited my older brother and I to his place to see Alien. I was about six or seven years old at the time, with my brother a few years older. My parents worked nights, so we pretty much lived with my grandmother. He was always into movies and he acquired a RCA Videodisc Player, along with that film and First Blood. Although I was sick, I still went and watched it. I vomited twice during the playthrough, but it was so worth it. I’d come to find out years later from my Mom that my Dad really didn’t need to invite us. He was just too scared of the movie to watch it alone. According to family legend, Alien was a date movie for my parents, and halfway into the film, my Dad (along with most guys, I’ve heard), was using my Mom as a shield. Mind you, this was a guy who kept multiple firearms in the house and knew how to use them. Alien was the brainchild of Dan O’Bannon and Ronald Shusett. Having worked on Dark Star for John Carpenter, O’Bannon wanted to create another space film, but with a more serious tone. They came up with the story, inspired by 1958’s B-movie classic It! The Terror From Outer Space and decided to roll with it. The feel for their story would be more like a set of space truckers hauling ore and picking up a stowaway space possum in their cargo. And that’s Alien in a nutshell. A crew of seven astronauts heading towards Earth in their mining vessel are awakened from hyper sleep when their spaceship – The Nostromo – picks up a distress signal from a nearby planetoid. They are given orders to investigate the signal, but when one of them is incapacitated by an alien life form, it brings trouble to the rest of the crew once they all return to the ship. Can they survive? The casting for Alien is damn near flawless. There isn’t a single person that feels out of place. The characterization for everyone is straightforward, from the wisecracking pair of Harry Dean Stanton and Yaphet Kotto to the very systematic Ian Holm as the Nostromo’s Science Division expert, it doesn’t take long for one to get to know them or at least wonder if they’ll make it through the story unscathed. Whether it’s Veronica Cartwright’s Lambert, who is nervous and jittery mid way through the film (and with good reason) or Sigourney Weaver’s Ripley who sees the potential threat before it gets out of hand, everyone here plays their part well. Ridley Scott was a young director brought on board to create the film. Now, normally, this is where the movie would be made and that really would be that. Scott’s visit to an art gallery in Paris would change the make up of the movie, according to the behind the scenes documentary. What set Alien aside from other space/horror fanfare were the influences of two major artists at the time, Jean Giraud and H.R. Giger. 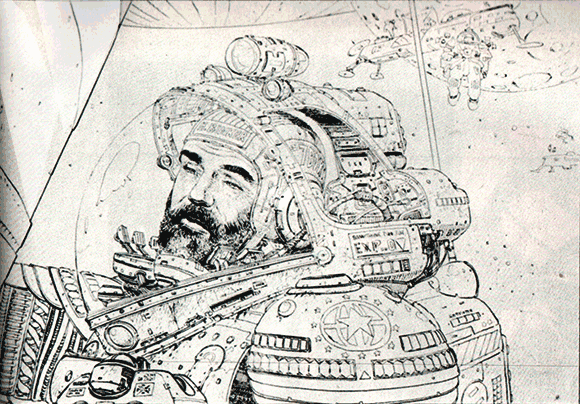 Concept Art by Jean Giraud, a.k.a. Moebius. Having seen his work in France, Ridley Scott felt that Giger had to be brought on board. Giger agreed to use some of his designs for the film and actually helped create the entire Space Jockey set. For the late 1970s, Giger’s look – elongated bones with sexual undertones – had to be a shock to audiences. Giraud, known to many fans as Moebius, was one of the greatest illustrators to have lived. Giraud was previously brought on to work on Alejandro Jodorowsky’s adaptation of Dune, but after that fell through, he ended up working with Scott for a bit, mainly coming up with the designs for the suits in the Nostromo. Together, both their designs would be used to bring something entirely new to audiences at the time. Also on hand was Carlo Rambaldi (E.T. the Extra-Terrestrial, Dune), who helped design the Alien’s mouth and motor features. In the effects department, Dennis Ayling, Nick Allder, and even Batman’s Anton Furst had a hand in setting the atmosphere for the Nostromo and LV-426. The result is a sense of claustrophobia. The Nostromo’s hallways aren’t the immaculate ones you’d find on board the Enterprise or the roomy ones on the Millennium Falcon. They’re tight, dimly lit with an obvious function over form factor to them. It’s a space rig. With older monster films, the creature usually is just one form. Giger’s Alien had three distinct forms used, which has always made me curious for the initial audience reactions. The first encounter is with a the Facehugger, an arachnid like creature with a tail that restricts the breathing of its potential victim. Add to this the notion that it uses molecular acid for blood. How do you even fight such a thing? Imagine thinking this is the “big bad” you’re going to see throughout the movie. Scott was particular in having the advertising reference as little as it could about the Alien itself (though the toy line kind of ruined that). Just when you’re comfortable with the possiblity of facehuggers crawling around, the movie switches gears and introduces us to the Chestburster, a phallic snake of a creature (thanks again to Giger). . The scene was fantastic. Although the cast was told what was supposed to happen with Kane (John Hurt), they weren’t completely filled in on how it was supposed to occur. It was a two part process. The first involved trying to hold down Kane, and the second was setup with John Hurt in the table to have the “push through”. So, when Kane lets out that one big scream, everyone’s reactions are real. You can see that both Parker (Yaphet Kotto) and Dallas (Tom Skerritt) are completely stunned. Veronica Cartwright (and her character Lambert) caught the worst of all this and also had the best reaction. When the Chestburster appears, the effects blood pumps caught Cartwright full on and it was all kept on film. I’m told that the scene in its initial run had people curling in their seats, standing to move to the back of the theatre (for some distance) or walking out altogether. What I wouldn’t give for a Time Travelling DeLorean and an Opening Night movie ticket to that. So now, there’s a snake running loose on the ship. The film spares very little time before our newborn becomes an adult. Mostly sleek and skeletal, the adult Alien is the stuff of nightmares, but thanks to Scott, and Cinematographer Derek Vanlint, we don’t see much of the Alien until the last act of the movie. Like the Batman, we only see it pounce, and that’s a testament both to the lighting used and the editing of shots. Scott’s close-ups on the Alien’s mouth and forehead doesn’t give anyone enough time to fully make out what it is entirely. Credit also goes to Bolaji Badejo, who portrayed the Alien. At 6’10”, Badejo was perfect for the creature sense of stature and movement, particularly with Harry Dean Stanton’s Brett having to stare up at him in shock. The production wasn’t without an issue here or there. Giraud’s suits – which had a samurai feel to them – had problems with the ventilation, so some of the actors nearly experienced exhaustion while working in them. This was later remedied, of course. Alien remains one of Jerry Goldsmith’s best scores, though it’s also a simple one. The music isn’t so much horrific as it just classical. The music in Alien isn’t really used to imply any kind of horror (save for perhaps one sequence), but perhaps that’s a good thing. The music lets the movie do the talking instead of throwing zingers. There’s very little I can say about the score outside of that. 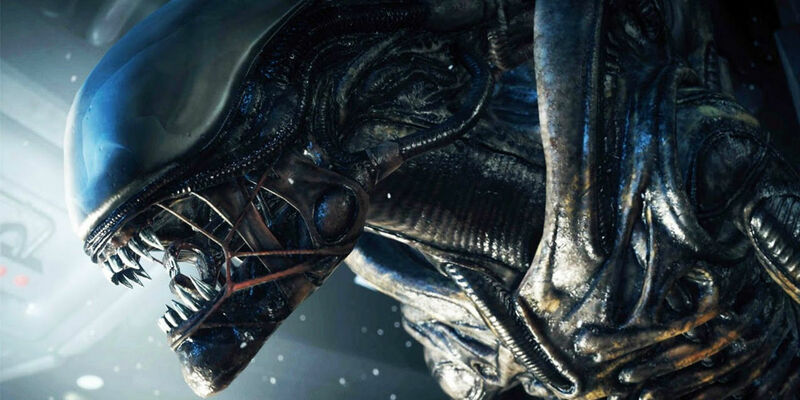 Alien would go on to spawn seven extra films, though personally, only James Cameron’s Aliens (1986) and Ridley Scott’s Prometheus (2012) are the two worth seeing. Alien 3 (1992) is beautiful, thanks to David Fincher and Cinematographer Alex Thomson, but also kind of damaged the timeline. So, turn out the lights, settle in with the food of your choice and enjoy Alien Day. The Space Jockey. Much of Giger’s designs looked like bone. * – A thank you goes out to Kevin Carr of Fat Guys At the Movies. He once featured It! The Terror From Outer Space years ago during the weekend Live Tweets he used to host. It was a treat to watch.